Four slain police officers are honored at a memorial service Tuesday in Lakewood, Washington. Seattle, Washington (CNN) -- The sister of the suspect in the killing of four police officers in Washington was charged Wednesday with helping another suspect connected to the crime elude authorities, prosecutors said. Latanya Clemmons was the seventh person charged in connection with the November 29 police killings and intense manhunt for suspected gunman Maurice Clemmons. Clemmons, 37, was shot and killed by a Seattle police officer after a two-day manhunt that stretched across the Seattle and Tacoma, Washington, metropolitan areas. Friends and family helped Clemmons during the search, authorities said. Latanya Clemmons was charged Wednesday with rendering criminal assistance, according to a statement from Pierce County Prosecutor Mark Lindquist. Clemmons helped her brother's alleged getaway driver rent a hotel room and gave him bus fare to leave the state and elude police, Lindquist said. "We will not rest until everyone who assisted the killer, in any way, is brought to justice," he said. "When you help a criminal, you become a criminal." Police say Maurice Clemmons killed the four officers from Lakewood, Washington, in an ambush-style shooting at a coffee shop. 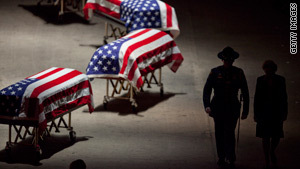 On Tuesday, an estimated 20,000 people attended a service for the victims -- Sgt. Mark Renninger and officers Tina Griswold, Ron Owens and Greg Richards.